Ok, this is it, the last of my convention swaps - at least I think so! I had actually done this card with my Christmas in July stamp campers and made extra so I could swap it since I loved it so much. It uses the long beloved stamp set, Lovely as a Tree, but I teamed it with the greeting from Many Merry Messages and the Texturz plates and my Big Shot. Doesn't the texturizing give it such an elegant look? LOVE that! The ribbon is Mellow Moss Taffeta to match the layer of cardstock and the card itself is Handsome Hunter. 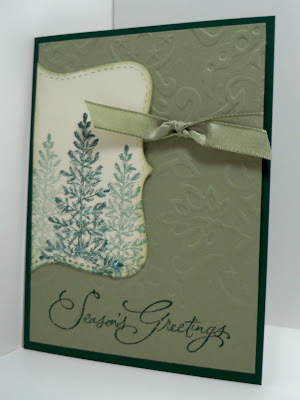 I stamped the tree 3 times on the Very Vanilla piece cut out with the Top Note Die and the Big Shot. It was not re-inked between the stamping so it would give it depth. A little sponging around the edge and some glitter dotted on and it was done! Oooh, this gives me ideas! Thank you!